Zoals jullie hebben kunnen lezen in onze twee blogs (blog dag 1 en blog dag 2) was er genoeg te beleven op de European Collaboration Summit in Mainz. Tijdens het checken van de Twitterfeed #CollabSummit viel ons oog op de posts van @LuiseFreese. Zij houdt zich, net als Onz365, bezig met user adoption van digitaal samenwerken. 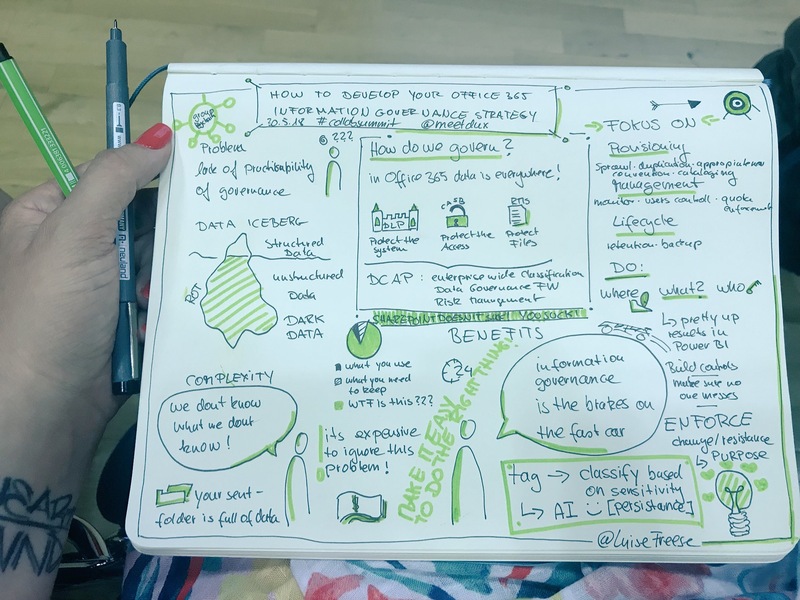 Luise volgde veelal dezelfde sessies als ons en maakte van deze sessies een zogeheten sketchnote. 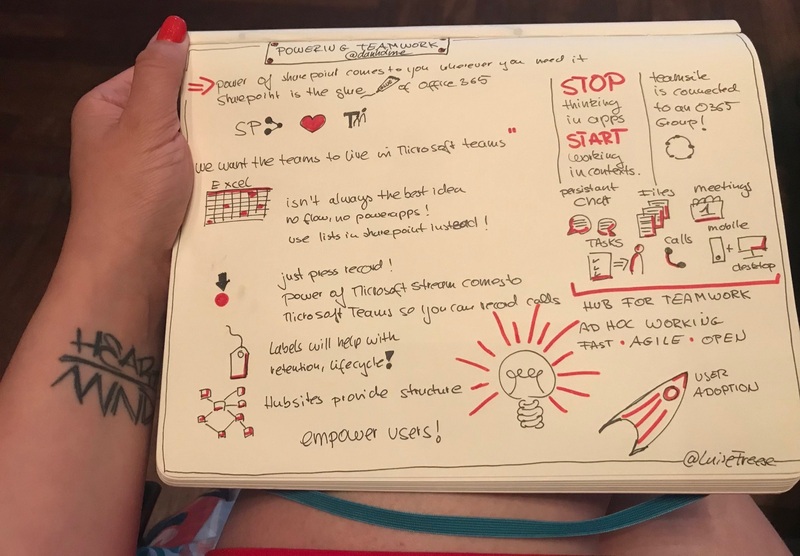 Wat sketchnotes zijn? Kort samengevat zijn het aantekeningen welke ondersteund worden door afbeeldingen. En omdat een afbeelding vaak meer zegt dan een heel verhaal willen we deze sketchnotes graag met jullie delen. In onderstaande acht beelden heeft Luise haar presentaties samengevat, erg leuk! 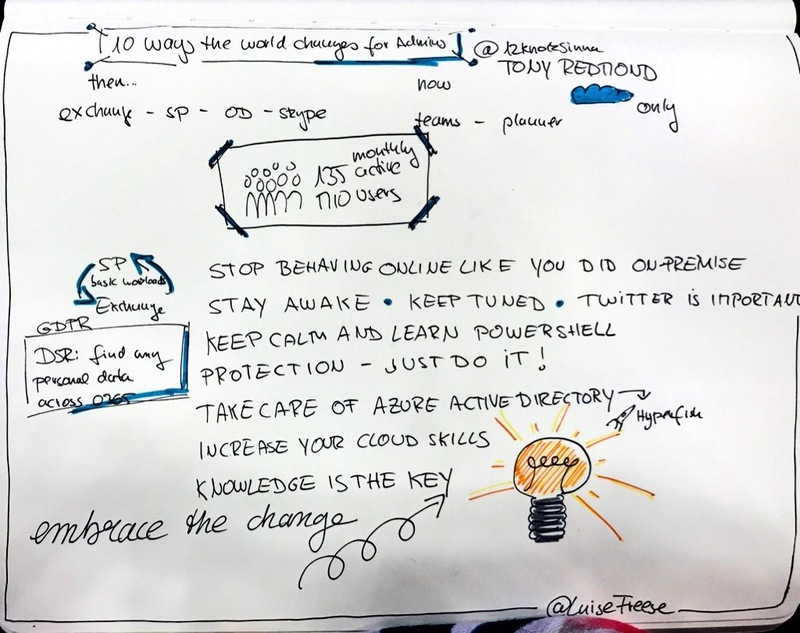 Ten Ways the World Changes for Admins When your Office 365 Migration Finishes by Tony Redmond (@12Knocksinna): What happens next after you finish moving mailboxes to Office 365? The answer isn’t often very clear but what is certain is that those who administer tenants have very different workloads to deal with. New applications, new functionality, a new cadence for software development, and many different tweaks to the way things worked on-premises. In this session, we look at some of the challenges and opportunities that exist inside Office 365 once your migration is complete. 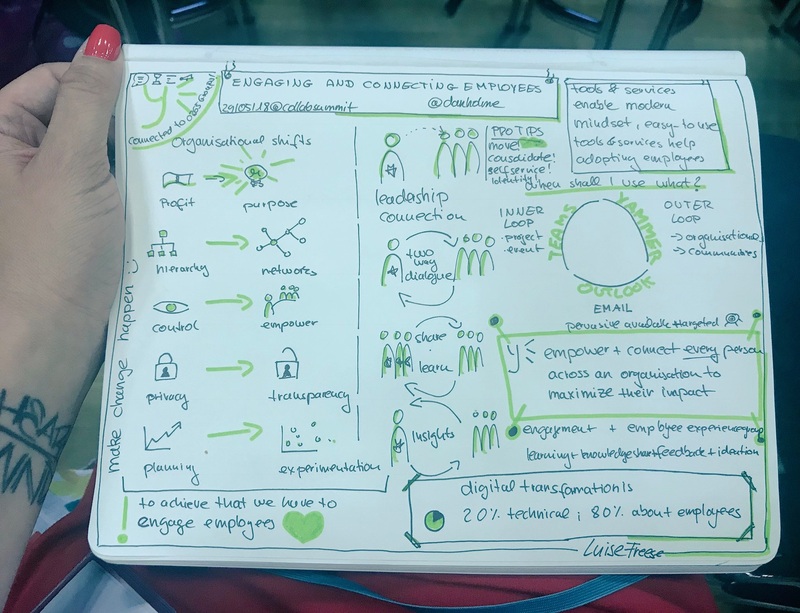 Connecting and Engaging employees by Dan Holme (@danholme): Learn about the many solutions available on how to engage your employees and create connection with leaders in your organization. Using Office 365, primarily SharePoint, Yammer along with Stream, Teams, and Forms, you'll explore the possibilities to create engagement and learn from examples of how customers and we at Microsoft do this. 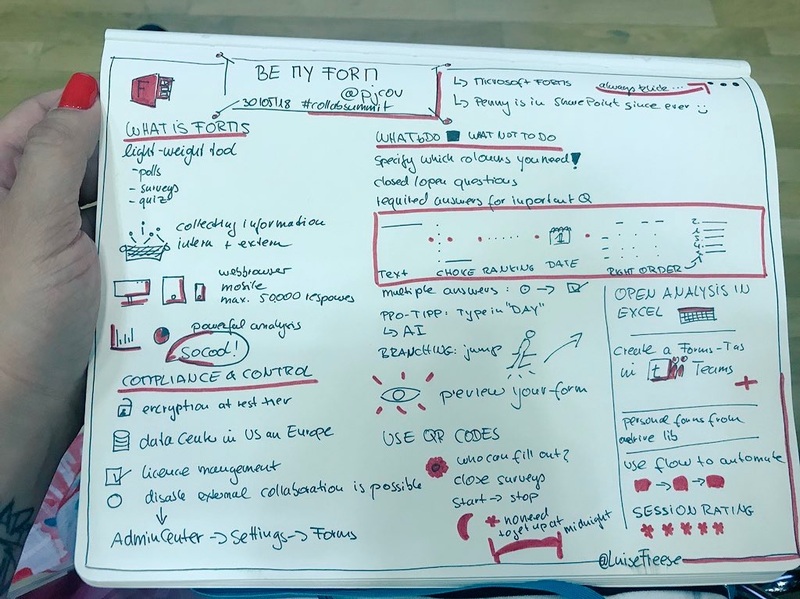 Be my form by Penny Coventry (@pjcov): Have you used Microsoft Forms yet? In this session, Penny will show you how to use Microsoft Forms to create, respond and analyse surveys and quizzes for Office 365 users. How from within other Office 365 workloads, such as, Microsoft Teams and Planner, you can interact and surface your forms. Powering teamwork by Dan Holme (@danholme): Microsoft Teams is the hub for teamwork in Office 365 that brings together conversations, files and tools. Teams gives people a single place to communicate and collaborate with others so that teams can achieve more. SharePoint connects the workplace and powers content collaboration. Together, SharePoint and Teams are greater than the sum of their parts. Join us for an overview of how these products interact with each other and learn about latest integrations we are working on to bring the richness of SharePoint directly into Teams experiences and vice versa. We will also look at teamwork use cases beyond file sharing, including shared news, lists, and apps. And we’ll explore how to structure teams and projects with hub sites. 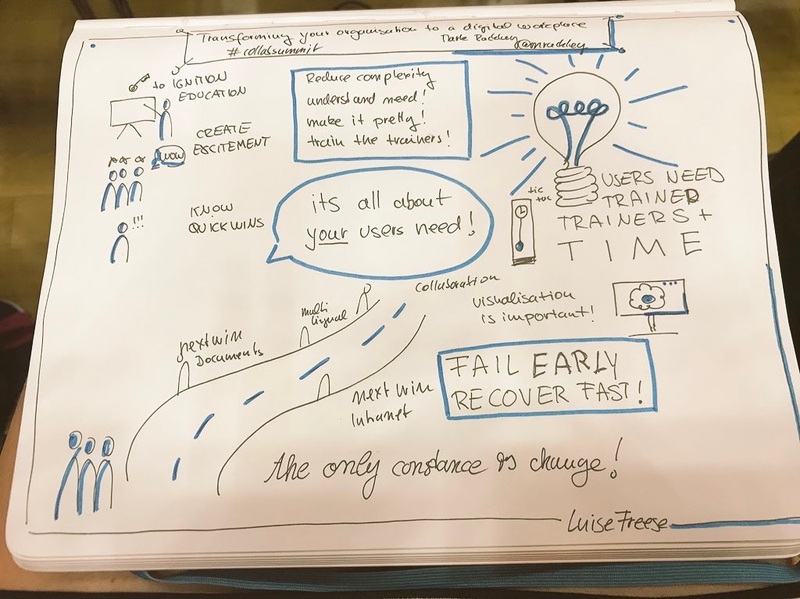 Transforming your organization to a digital Workplace by Mark Rackley (@mrackley): Transforming into a digital workplace can seem like a daunting task, with outdated legacy apps to support, skeptical stakeholders who can't envision the benefits, and workforce that must be retrained. Where do you even start? Learn how a global manufacturing company is undergoing a digital transformation using Office 365. From simple steps like moving email to the cloud, to more complex collaboration needs with joint venture partners, you’ll learn about the challenges, quick wins, and long term success of an organization committed to change. You will leave encouraged that no matter where your organization is starting from, that a digital transformation through Office 365 is possible! How to Develop Your Office 365 Information Governance Strategy in 4 Steps by Dux Raymond Sy (@meetdux): So you’ve made the decision to move to Office 365 – now how do you ensure your critical business information is secure in the cloud? In this interactive session, you will learn how to reduce risk and ensure your users do the right thing by employing industry best practices for information governance, risk, and compliance. We’ll also explain how recent enhancements from Microsoft – including Office 365 Security & Compliance Center and Azure Information Protection – as well as other related technologies can help. This session will empower you to implement proven tactics to ensure your Microsoft Cloud investment meets business needs while protecting your most sensitive data. 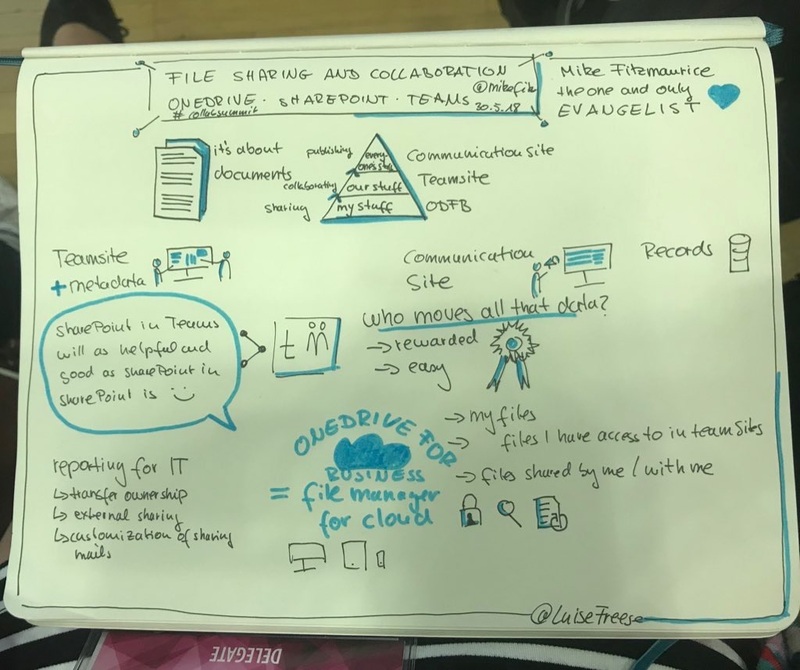 File Sharing and Collaboration with OneDrive, SharePoint and Teams by Mike Fitzmaurice (@mikefitz): OneDrive, SharePoint, and Teams provide a rich set of solutions for sharing files with people inside and outside your organization, and working together in real time. This session provides an insider's look at the sharing model for OneDrive and SharePoint, with explanations of all the external sharing options available and when to use them. Learn how we're making sharing easier for senders and recipients while providing even more ways for administrators to customize sharing to fit their organizations. 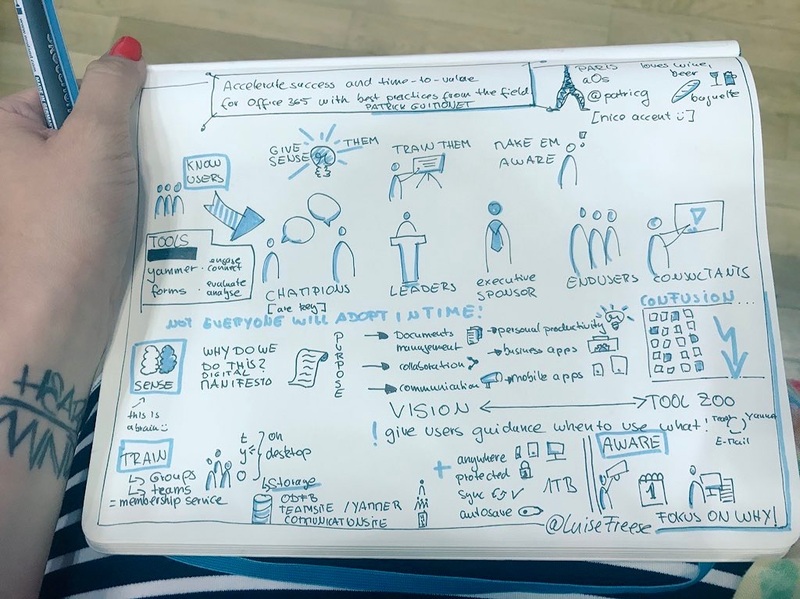 Accelerate success and time-to-value for Office 365 with best practices from the field by Patrick Guimonet (@Patricg): Let's review and discuss in this session some best practices that helped our customers to reach success sooner and more easily in their journey to get the most out of Office 365.